It was quite an adventure for our wayward kitty. She went missing the day after my birthday in December and found while my father was in the hospital a little over two weeks ago. (Note: She was actually brought home a couple of days ago.) My husband shared a detailed account with me on how he eventually got her home. 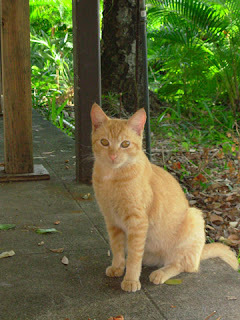 Suffice to say, that he saw a wild cat transformed into the sweet and affectionate cat we knew, as soon as she got home. He is the actually cat-lover in the family. My mother and I attended Mass and Adoration of the Blessed Sacrament which followed the celebration of the Holy Mass, at St Stephen's Church's chapel. Fr. Dariusz K. reminded everyone that tomorrow is Divine Mercy Sunday and that today was the 9th day of the Divine Mercy Novena. The pastor and sacristan are both Polish and this is a predominantly Spanish-speaking community of parishioners. When I closed my eyes and listened to the prayers of the Chaplet of Divine Mercy in the original Polish, I could almost hear the voice of our late Holy Father Pope John Paul II praying with us. What a beautiful language Polish is! 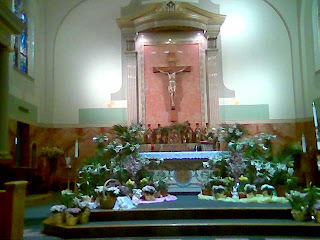 The Holy Mass and the prayers are often said in three languages: English, Spanish and Polish. Today, I had the opportunity to pray the 9th day of the novena in Spanish. It may be because I had to pay more attention as I read it, but it really was more meaningful for me to read about the lukewarm souls in the Spanish language. The next time I find a person struggling or in turmoil, I will offer to pray with them—or at least for them if they decline. 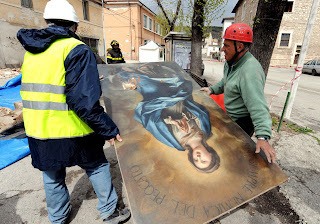 Roman churches, funerary monuments and museums where artistic treasures are housed have been damaged in the Italian region affected by the earthquake. 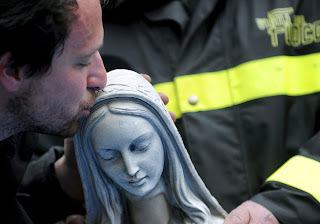 Even though the extent of the damage has not been calculated, David Rijser, an expert in Classic and Renaissance antiquities has tried to calculate the losses. I will do a significant but hidden act of charity to someone whom I find difficult to be with, perhaps even someone I consider to be my enemy. And let perseverance be perfect, so that you may be perfect and complete, lacking in nothing. But if any of you lacks wisdom, he should ask God who gives to all generously and ungrudgingly, and he will be given it. For that person must not suppose that he will receive anything from the Lord, since he is a man of two minds, unstable in all his ways. The brother in lowly circumstances should take pride in his high standing,and the rich one in his lowliness, for he will pass away "like the flower of the field." For the sun comes up with its scorching heat and dries up the grass, its flower droops, and the beauty of its appearance vanishes. So will the rich person fade away in the midst of his pursuits. No one experiencing temptation should say, "I am being tempted by God"; for God is not subject to temptation to evil, and he himself tempts no one. He willed to give us birth by the word of truth that we may be a kind of firstfruits of his creatures. Stay with me, Jesus, for it is getting late and the day is coming to a close, and life passes, death, judgment, eternity approaches. It is necessary to renew my strength, so that I will not stop along the way and for that, I need You. It is getting late and death approaches. I fear the darkness, the temptations, the dryness, the cross, the sorrows. O how I need You, my Jesus, in this night of exile! Thanks to In Him We Live and Move and Have our Being for sharing this prayer. The Catholic archbishop of Johannesburg, Buti Tlaghale, has expressed his disappointment about poor Eucharistic practice among some priests and the faithful. The Eucharist effectively makes present the death and resurrection of Jesus Christ, yet there is evidence that some Catholics do not show faith in the real presence of Christ in the Blessed Sacrament, Archbishop Tlaghale said in his homily on Holy Thursday. 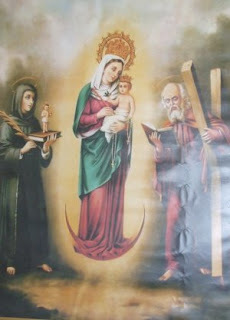 “Many enter the church and do not make the sign of the cross with holy water. Many no longer genuflect; not even a bow that acknowledges the presence of Christ in the tabernacle,” the archbishop said. He also noted that altar rails had been dismantled, making it no longer imperative for the faithful to kneel when receiving the ‘Body of Christ’. 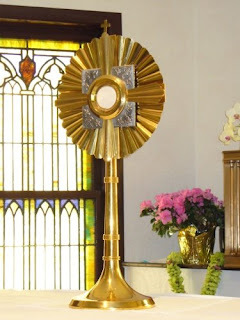 The archbishop recommended that where possible the centrality of the tabernacle be restored and the practice of genuflecting and silence revived. “Church law requires us to fast for an hour before the Eucharist. The chewing of gum during Mass is simply distasteful,” Archbishop Tlaghale further said. 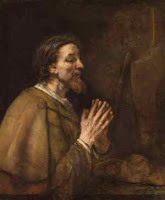 He challenged priests, as custodians of the Eucharist, to promote adoration and ensure that papal or Vatican documents on the Eucharist are well known by Christians. For the Ultimate Pro-Life Statement, Don't Miss the Kurtz Family on EWTN's "Life on the Rock"
My friend in Hawaii Janina, shared this photo with me. She thought I would like it and she was right. She is so cute. She mentioned that her mom got very close to the Archbishop. As you can see by the photo, she did. Mahalo Janina and mom! I watched most of the installation Mass yesterday afternoon on EWTN...where else? It was thrilling to watch the beauty that is our Catholic Church during this newsworthy event. 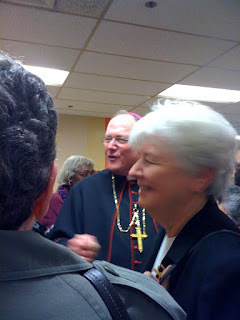 Archbishop Dolan is certainly a people-person/bishop. He seemed genuinely happy to be in New York and the warmth he greeted everyone was returned to him as well.
. . . the Resurrection goes on, as His Church continues to embrace and protect the dignity of every human person, the sanctity of human life, from the tiny baby in the womb to the last moment of natural passing into eternal life. As the Servant of God Terrence Cardinal Cooke wrote, "Human life is no less sacred or worthy of respect because it is tiny, pre-born, poor, sick, fragile, or handicapped." Don't mess with our Church! Doesn't that quote make you proud to be Catholic? May God bless and protect you today on your birthday and every day of your life, especially during your pontificate. In preparation for the canonization of Blessed Damien Joseph deVeuster, actor Casey Groves arrives in Hawaii April 14 to educate and present the "One Man Play, Damien" written by Aldyth Morris. This "One Man Play" portrays the compelling story of our beloved Belgium-born Father Damien, who ministered to people afflicted with Hansen's Disease and banished to the island of Molokai, before dying of the disease in 1889, at the age of 49. The "One Man Play" Damien is being presented in parishes and schools. Although benefactors have stepped forward to take care of any necessary expenses for the school performances, free will offerings are most welcome to aid Casey as he engages with our Hawaii students. Come and relive Fr. Damien's story through Casey Groves. For more information about Casey Groves and his performances, visit https://caseygroves.backpackit.com/pub/705567. Preview a 6-minute video is at http://www.caseygroves.com/damien.htm. To schedule a performance, please contact Leoda Shizuma at shizuma@wave.hivc.net or 808-553-5583. Regarding my post Update on Cloistered Nuns in NJ and Prayer Request. I received the following information via an email from a sister who wishes to remain anonymous. I just saw your entry about Union City . Let me give you some accurate information. Sr. Gemma and Sr. Carol Marie are at the Infirmary at the Dominican Sisters of Caldwell. So, with Mother Mary Jordan there along with 2 of our nuns there are 5 nuns being beautifully cared for by our Dominican Sisters! A little mini-monastery, you might say! Sr. Mary Aquinas transferred to the Bronx monastery and is very happy there. She looks great! The monastery will be used by several religious congregations in NJ as a place for single moms with children to live. The building is in a lot of disrepair and will need renovations. When a monastery begins the process of closure the Master of the Order appoints a friars as vicar to over see everything. For union City Fr. Izzo, the provincial has been appointed and he has been amazingly tender and concerned for them. Sr. Mary of the Compassion’s artwork is going to the Provincial archives. That’s about all I can tell you for now! 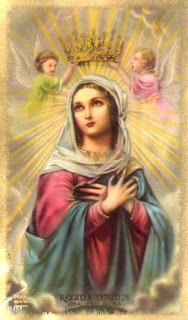 During Easter, we pray the Regina Coeli instead of the Angelus. One of my mom's favorite EWTN hosts has always been Johnette Benkovic. She suffered along with Mrs. Benkovic when she lost her beloved son and then when she lost her beloved husband. 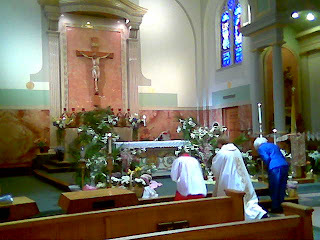 Photos of Easter morning Mass Blessed Sacrament Church, Paterson, NJ. 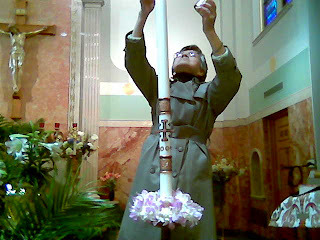 The little lady lighting the Easter candle is my mom. Thanks to Father Patrick R. for his kindness to our family. It was his idea to place the Hawaiian lei sent to my mom by our good friend Mrs. Lum, on the Easter candle. Pictures taken by my phone camera as I forgot my digital camera today.